While minister from the American colonies to France from 1776 to 1785, Benjamin Franklin was a popular celebrity. The rage for his likeness resulted in images ranging from marble busts and paintings to prints and miniatures. 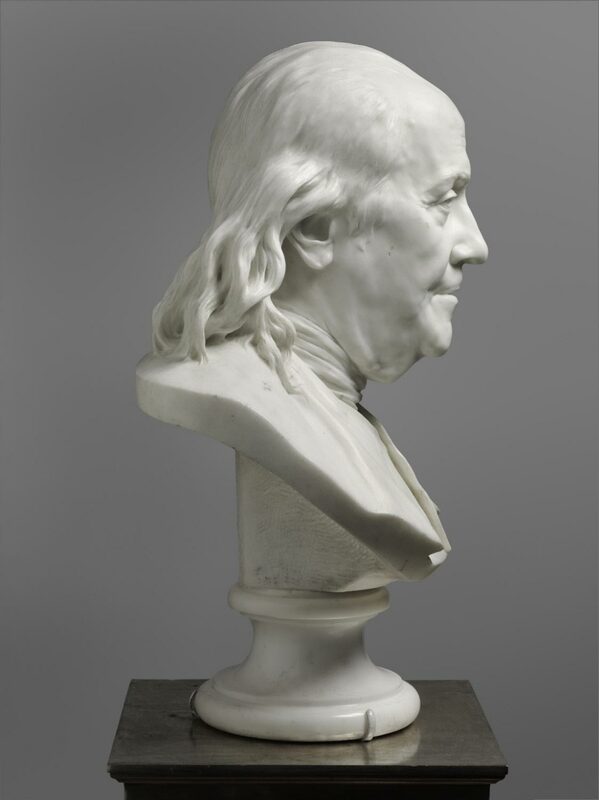 This bust was created by Jean-Antoine Houdon, the leading portrait sculptor of the eighteenth century. It is the most powerful and fully realized version of the best-known portrait of Franklin. Houdon's accomplishment is the more remarkable in that Franklin did not sit for the sculptor--the men did not meet formally until 1783. 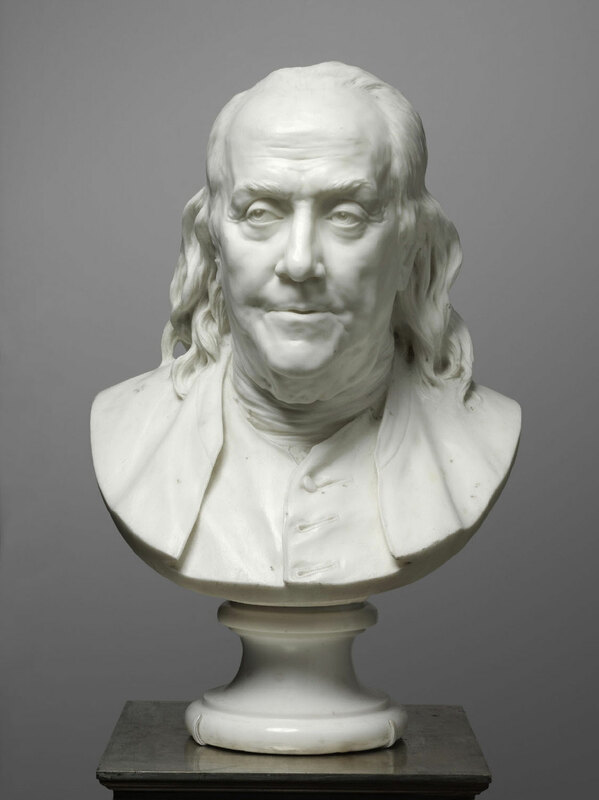 Presumably Houdon drew upon his experience of seeing Franklin at events such as meetings of the Masonic lodge to which they both belonged. 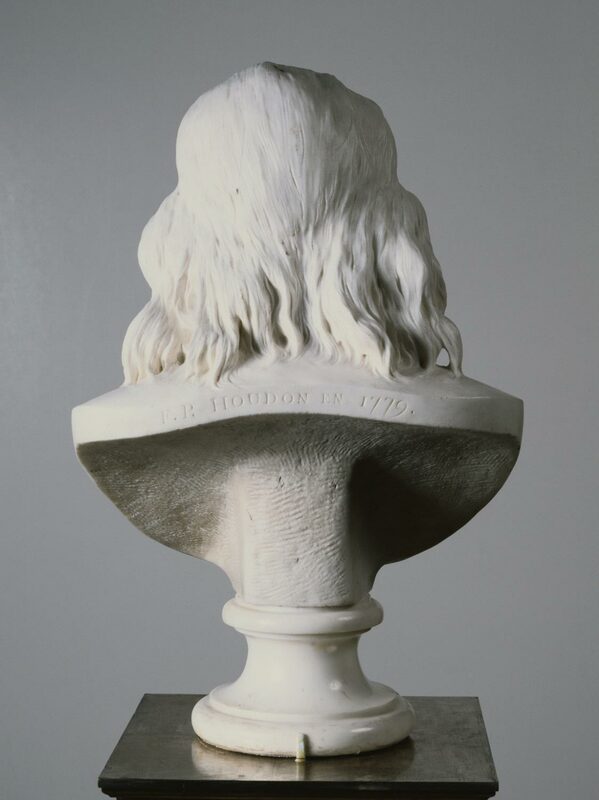 Houdon exhibited a terracotta version of the bust in the French Royal Academy Salon exhibition of 1779. Like other sculptors, Houdon sent works to the Salon to attract orders for reproductions in various materials. Using molds, Houdon could produce copies in plaster and terracotta to which he added distinctive touches. A German prince and Thomas Jefferson purchased plaster versions, and Franklin was given four by Houdon. There are only two examples of Houdon's Franklin bust in the desirable and costly material of marble. The bust in the Metropolitan Museum of Art, dated 1778, remained in the sculptor's possession until 1785. 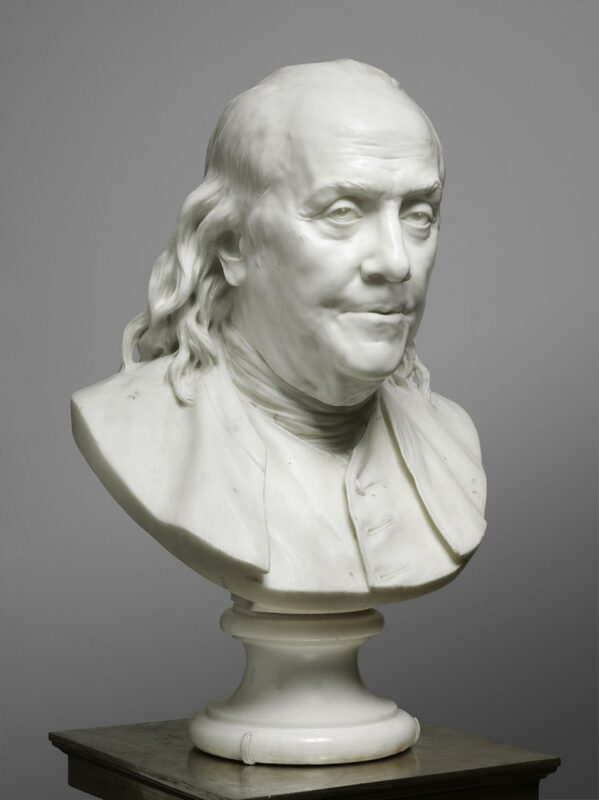 The Philadelphia Museum of Art's bust, dated 1779, is in every way the more carefully carved portrait. It was commissioned by an unknown person who had most likely seen the terracotta in the Salon or in Houdon's studio. The differences between the two marble busts may be due to the sculptor's exceptional effort to please his patron, and perhaps also to Houdon's increased familiarity with his subject's features. While minister from the new American republic to France from 1776 to 1785, Benjamin Franklin was a celebrity who embodied the emerging nation, and many artists hastened to attempt his likeness. This masterpiece is a great artist’s portrait of a great man. Jean-Antoine Houdon, who portrayed a series of eminent intellectuals, doubtlessly counted on Franklin’s fame to guarantee many sales of plaster versions and to attract attention to himself. 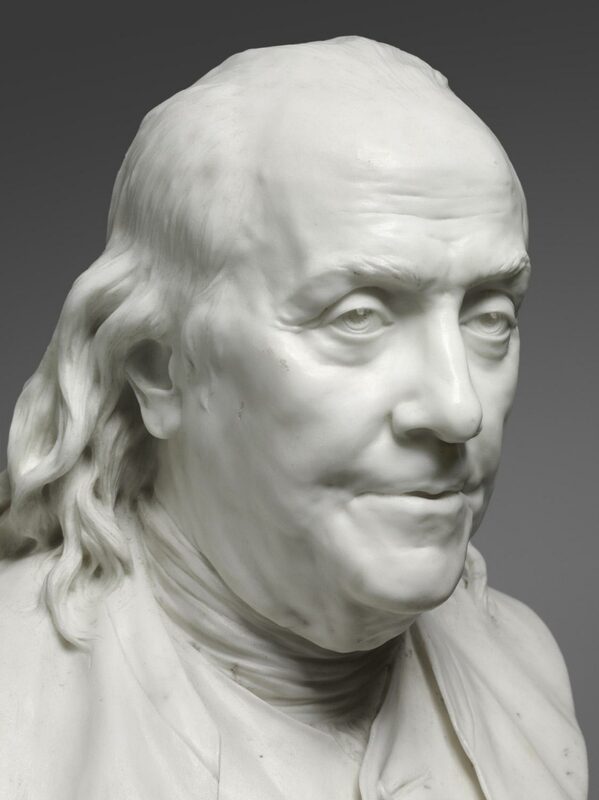 Houdon’s Franklin is posed frontally, head slightly lowered, his asymmetrical face rendered in great detail. The treatment of the eyes is a superb example of the sculptor’s sensational technique, one admired at the time as more accurate than any painter’s. The gaze is directed to one side and the mouth slightly open. 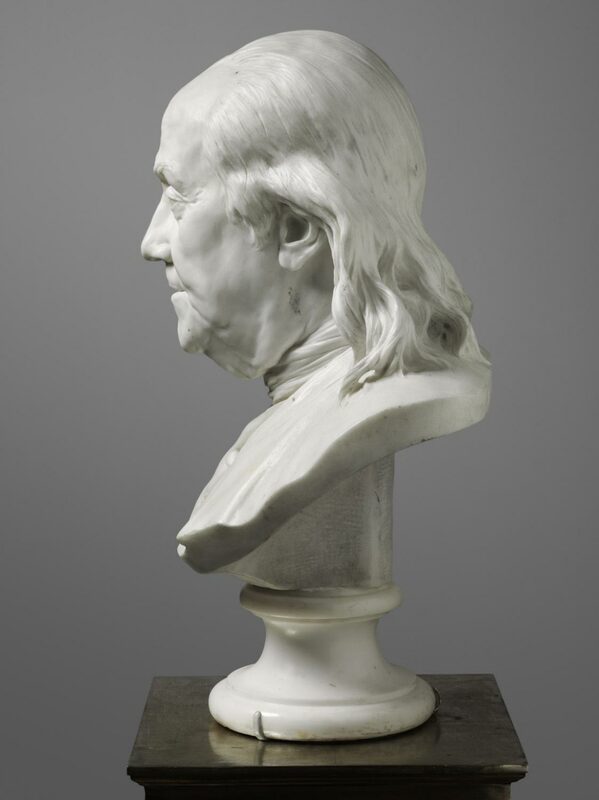 Normally, Franklin was taciturn, and Houdon rendered his deliberate manner so that it appears to capture the outward manifestation of Franklin’s mind at work. The result is fascinating and powerful. Houdon’s vision of Franklin is all the more impressive because it was realized without the benefit of studio sittings. We know that the sculptor could only have observed Franklin at public gatherings. The superiority of the bust must also owe something to the circumstances of the commission. The exceptional attention and skills lavished on this marble point to a very important, but unfortunately still-unknown, patron. This Museum has a continuing interest in acquiring historic portraits of Franklin in many forms. Most have come as gifts, including a collection of prints donated by Mrs. John D. Rockefeller, Jr., in 1946. The Houdon bust crowns the collection as a powerful presence in the European and American galleries. It is fitting that such an extraordinary portrait of the most famous Philadelphian belongs to the Museum at the end of the boulevard that bears Franklin’s name. Dean Walker, from Philadelphia Museum of Art: Gifts in Honor of the 125th Anniversary (2002), p. 33. In December 1776, Benjamin Franklin arrived in Paris as minister for the American colonies, tasked with obtaining financial and military support for the Revolutionary War. Already well known as a scientist, thinker, and political leader, Franklin created a sensation, generating huge demand for portraits of a veritable celebrity. In Jean-Antoine Houdon, Franklin's genius arguably met its most able interpreter. While not the first sculpted image realized, it is perhaps the most enduring and best-loved. The leading portrait sculptor of his day, Houdon imbued his greatest portrayals with astonishing yet restrained naturalism, apparent in the intently described, mobile features of this bust--the finer of two versions carved in costly marble. Given Franklin's taciturnity, the choice of expression--his mouth slightly open as if about to speak--is daring, and underlines the sculptor's thoughtful characterization of his subject. Houdon's success with Franklin later gave him opportunities to depict other American patriots, most notably Thomas Jefferson and George Washington. Jack Hinton, from Philadelphia Museum of Art: Handbook of the Collections, 2009.